One of the questions I’m asked the most often about social business is about its key success factors. Specifically, what fundamentally makes a given enterprise social media effort likely to be successful? While the answers to this haven’t changed that much over the last couple of years, I’ve found it’s usually key to differentiate at least two — and perhaps as many as four — distinct timeframes over the life of an effort, as the focus on what’s most important changes significantly with each phase of a social business project. The two major timeframes that matter the most overall are 1) the initial process to define and justify a given social business initiative and 2) the early work to develop an engaged community around the resulting social business solution (a customer community, advocate program, social marketing campaign, etc.) Both of these are delicate time periods that require a careful focus on what matters most. To a lesser extent, two other timeframes are important as well, which I’ve explored in my social business adoption research. These phases are 3) achieving a critical mass of participation and 4) achieving a sustainable process of engagement over the long term. As it turns out, the first and second phases almost invariably require a passionate and involved management sponsor, preferably a well-respected senior executive that creates the air cover for the changes required in the organization as well as the necessary resources. But it’s the second, third and fourth phases that all require the single most important capability of all: Effective community management. Over the years, I’ve explored the emerging capability of community management, a greatly under-recognized discipline that requires a specific set of community manager skills and is relatively unfamiliar to those that aren’t involved in social media. At the most basic level, community management is required to nurture, grow, educate, manage, measure, and operate a social business solution. While we’re really still in the primeval ‘cave painting’ days of social business in general, as part of the maturity process we see that community management itself is very much in the process of evolving as well. For example, it is only now reaching the specialization stage, where we can see dedicated roles for functions such as engagement, analytics & reporting, training & development, or even strategic planning. Other indicators of maturity of the profession have grown as well. An excellent new report, titled The 2013 State of Community Management from The Community Roundtable underscores this with hard data: Community management teams are now establishing standards for their industry around content management and community programming. They’ve also begun establishing well-documented playbooks that their teams can organize around and follow to provide consistent results and cohesive direction. Metrics and reporting, while still highly variable across the industry, are also becoming a core competency for teams as they increasingly attempt to determine and communicate their business impact. 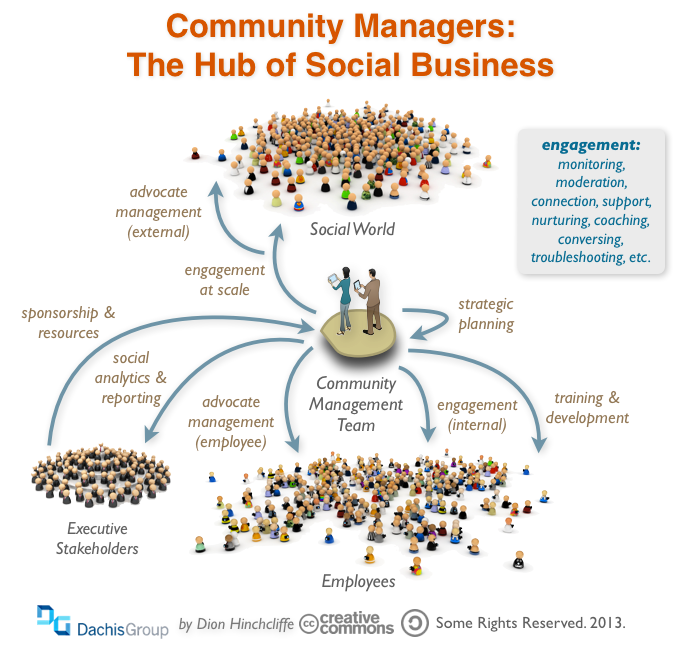 We also see that community managers tend to form the core staff of emerging social media centers of excellence. Sophisticated new engagement strategies. Today’s community management departments realize that they can’t do it all, nor should they. Engagement at scale is increasingly the name of the game, from cultivating and orchestrating advocates to real-time tool-assisted processes that greatly boost the reach and relevance of community managers while reducing the individual task time required to engage widely. The strategic use of data to guide community management activities and goals. We’ve seen an operational blueprint emerge over the last several years where social data is at the core of the workflow of community management (as well as other social business functions like marketing.) Community managers today can operate analytic tools that derive tactical situations as well as strategic business intelligence, and doing so is part of their core training and an integral part of their playbook. We’re also seeing that they use their content as a strategic data asset as well. A focus on eliciting valuable business outcomes. One of the most intriguing tidbits from the 2013 State of Community Management report was that “one interesting difference between the survey average and those community teams that can report the value of community management is the higher level of interaction with most other department and the notable increased interaction with their finance team.” Successful community managers have always had a broad interface with multiple departments across the company, but we can now see it’s the business savvy community managers that can zero in on the value and identify ROI. While some of this is not necessarily surprising (certainly the rise of analytics has been perhaps the most obvious trend of all in social business), the interesting bits are often in the specific details and I urge you to read the 2013 SOCM report carefully. What else are you seeing today’s community manager’s focusing on?